Although, in modern physics, many elementary particles are extremely short-lived, others such as protons are virtually immortal. But either way, a particle, while it does exist, is assumed to be continuously existing. And solid objects such as we see all around us like rocks and hills, are also assumed to be ‘continuously existing’ even though they may undergo gradual changes in internal composition. Since solid objects and even elementary particles don’t appear, disappear and re-appear, they don’t have a ‘re-appearance rate ’ ─ they’re always there when they are there, so to speak. However, in UET the ‘natural’ tendency is for everything to flash in and out of existence and virtually all ultimate events disappear for ever after a single appearance leaving a trace that would, at best, show up as a sort of faint background ‘noise’ or ‘flicker of existence’. All apparently solid objects are, according to the UET paradigm, conglomerates of repeating ultimate events that are bonded together ‘laterally’, i.e. within the same ksana, and also ‘vertically’, i.e. from one ksana to the next (since otherwise they would not show up again ever). A few ultimate events, those that have acquired persistence ─ we shall not for the moment ask how and why they acquire this property ─ are able to bring about, i.e. cause, their own re-appearance : in such a case we have an event-chain which is, by definition, a causally bonded sequence of ultimate events. But how often do the constituent events of an event-chain re-appear? Taking the simplest case of an event-chain composed of a single repeating ultimate event, are we to suppose that this event repeats at every single ksana (‘moment’ if you like)? There is on the face of it no particular reason why this should be so and many reasons why this would seem to be very unlikely. Newtonian physics, likewise 18th and 19th century rationalism generally, assumes what I have referred to elsewhere as the Postulate of Spatio-temporal Continuity. This postulate or principle, though rarely explicitly stated in philosophic or scientific works, is actually one of the most important of the ideas associated with the Enlightenment and thus with the entire subsequent intellectual development of Western society. In its simplest form, the principle says that an event occurring here, at a particular spot in Space-Time (to use the current term), cannot have an effect there, at a spot some distance away without having effects at all (or at least most?/ some?) intermediate spots. The original event sets up a chain reaction and a frequent image used is that of a whole row of upright dominoes falling over one by one once the first has been pushed over. This is essentially how Newtonian physics views the action of a force on a body or system of bodies, whether the force in question is a contact force (push/pull) or a force acting at a distance like gravity. As we envisage things today, a blow affects a solid object by making the intermolecular distances of the surface atoms contract a little and they pass on this effect to neighbouring molecules which in turn affect nearby objects they are in contact with or exert an increased pressure on the atmosphere, and so on. Moreover, although this aspect of the question is glossed over in Newtonian (and even modern) physics, each transmission of the original impulse ‘takes time’ : the re-action is never instantaneous (except possibly in the case of gravity) but comes ‘a moment later’, more precisely at least one ksana later. This whole issue will be discussed in more detail later, but, within the context of the present discussion, the point to bear in mind is that, according to Newtonian physics and rationalistic thought generally, there can be no leap-frogging with space and time. Indeed, it was because of the Principle of Spatio-temporal Continuity that most European scientists rejected out of hand Newton’s theory of universal attraction since, as Newton admitted, there seemed to be no way that a solid body such as the Earth could affect another solid body such as the Moon thousands of kilometres with nothing in between except ‘empty space’. Even as late as the mid 19th century, Maxwell valiantly attempted to give a mechanical explanation of his own theory of electro-magnetism, and he did this essentially because of the widespread rock-hard belief in the principle of spatio-temporal continuity. The principle, innocuous though it may sound, has also had extremely important social and political implications since, amongst other things, it led to the repeal of laws against witchcraft in the ‘advanced’ countries ─ the new Legislative Assembly in France shortly after the revolution specifically abolished all penalties for ‘imaginary’ crimes and that included witchcraft. Why was witchcraft considered to be an ‘imaginary crime’? Essentially because it offended against the Principle of Spatio-Temporal Continuity. The French revolutionaries who drew the statue of Reason through the streets of Paris and made Her their goddess, considered it impossible to cause someone’s death miles away simply by thinking ill of them or saying Abracadabra. Whether the accused ‘confessed’ to having brought about someone’s death in this way, or even sincerely believed it, was irrelevant : no one had the power to disobey the Principle of Spatio-Temporal Continuity. The Principle got somewhat muddied when science had to deal with electro-magnetism ─ Does an impulse travel through all possible intermediary positions in an electro-magnetic field? ─ but it was still very much in force in 1905 when Einstein formulated the Theory of Special Relativity. For Einstein deduced from his basic assumptions that one could not ‘send a message’ faster than the speed of light and that, in consequence, this limited the speed of propagation of causality. If I am too far away from someone else I simply cannot cause this person’s death at that particular time and that is that. The Principle ran into trouble, of course, with the advent of Quantum Mechanics but it remains deeply entrenched in our way of thinking about the world which is why alibis are so important in law, to take but one example. And it is precisely because Quantum Mechanics appears to violate the principle that QM is so worrisome and the chief reason why some of the scientists who helped to develop the theory such as Einstein himself, and even Schrodinger, were never happy with it. As Einstein put it, Quantum Mechanics involved “spooky action at a distance” ─ exactly the same objection that the Cartesians had made to Newton. So, do I propose to take the principle over into UET? The short answer is, no. If I did take over the principle, it would mean that, in every bona fide event-chain, an ultimate event would make an appearance at every single ‘moment’ (ksana), and I could see in advance that there were serious problems ahead if I assumed this : certain regions of the Locality would soon get hopelessly clogged up with colliding event-chains. Also, if all the possible positions in all ‘normal’ event-sequences were occupied, there would be little point in having a theory of events at all, since, to all intents and purposes, all event-chains would behave as if they were solid objects and one might as well just stick to normal physics. One of the main reasons for elaborating a theory of events in the first place was my deep-rooted conviction ─ intuition if you like ─ that physical reality is discontinuous and that there are gaps between ksanas ─ or at least that there could be gaps given certain conditions. In the theory I eventually roughed out, or am in the process of roughing out, both spatio-temporal continuity and infinity are absent and will remain prohibited. But how does all this square with my deduction (from UET hypotheses) that the maximum propagation rate of causality is a single grid-position per ksana, s0/t0, where s0 is the spatial dimension of an event capsule ‘at rest’ and t0 the ‘rest’ temporal dimension? In UET, what replaces the ‘object-based’ image of a tiny nucleus inside an atom, is the vision of a tiny kernel of fixed extent where every ultimate event occurs embedded in a relatively enormous four-dimensional event capsule. Any causal influence emanates from the kernel and, if it is to ‘recreate’ the original ultimate event a ksana later, it must traverse at least half the ‘length’ (spatial dimesion) of one capsule plus half of the next one, i.e. ½ s0 + ½ s0 = 1 s0 where s0 is the spatial dimension of an event-capsule ‘at rest’ (its normal state). For if the causal influence did not ‘get that far’, it would not be able to bring anything about at all, would be like a messenger who could not reach a destination receding faster than he could run flat out. The runner’s ‘message’, in this case the recreation of a clone of the original ultimate event, would never get delivered and nothing would ever come about at all. This problem does not occur in normal physics since objects are not conceived as requiring a causal force to stop them disappearing, and, on top of that, ‘space/time’ is assumed to be continuous and infinitely divisible. In UET there are minimal spatial and temporal units (that of the the grid-space and the ksana) and ‘time’ in the UET sense of an endless succession of ksanas, stops for no man or god, not even physicists who are born, live and die successively like everything else. I believe that succession, like causality, is built into the very fabric of physical reality and though there is no such thing as continuous motion, there is and always will be change since, even if nothing else is happening, one ksana is being replaced by another, different, one ─ “the moving finger writes, and, having writ, moves on” (Rubaiyat of Omar Khayyam). Heraclitus said that “No man ever steps into the same river twice”, but a more extreme follower of his disagreed, saying that it was impossible to step into the same river once, which is the Hinayana Buddhist view. For ‘time’ is not a river that flows at a steady rate (as Newton envisaged it) but a succession of ‘moments’ threaded like beads on an invisible chain and with minute gaps between the beads. So, returning to my repeating ultimate event, could the ‘re-creation rate’ of an ultimate event be greater than the minimal rate of 1 s0/t0 ? Could it, for example, be 2, 3 or 5 spacesper ksana? No. For if and when the ultimate event re-appeared, say 5 ksanas later, the original causal impulse would have covered a distance of 5 s0 ( s0 being the spatial dimension of each capsule) and would have taken 5 ksanas to do this. Consequently the space/time displacement rate would be the same (but not in this case the individual distances). I note this rate as c* in ‘absolute units’, the UET equivalent of c, since it denotes an upper limit to the propagation of the causal influence (Note 1). For the very continuing existence of anything depends on causality : each ‘object’ that does persist in isolation does so because it is perpetually re-creating itself (Note 2). and one pattern could change over into the other either randomly or, alternatively, according to a particular rule. As one increases the difference between the numerator and the denominator, there are obviously going to be many more possible variations : all this could easily be worked out mathematically using combinatorial analysis. But note that it is the distribution of the black and white at matters since, once a re-appearance rhythm has begun, there is no real difference between a ‘vertical’ rate of 0●0● and ●0●0   ─ it all depends on where you start counting. Patterns with the same repetition rate only count as different if this difference is recognizable no matter where you start examining the sequence. Why does all this matter? Because, each time there is a blank line, this means that the ultimate event in question does not make an appearance at all during this ksana, and, if we are dealing with large denominators, this could mean very large gaps indeed in an event chain. Suppose, for example, an event-chain had a re-appearance rate of 4/786. 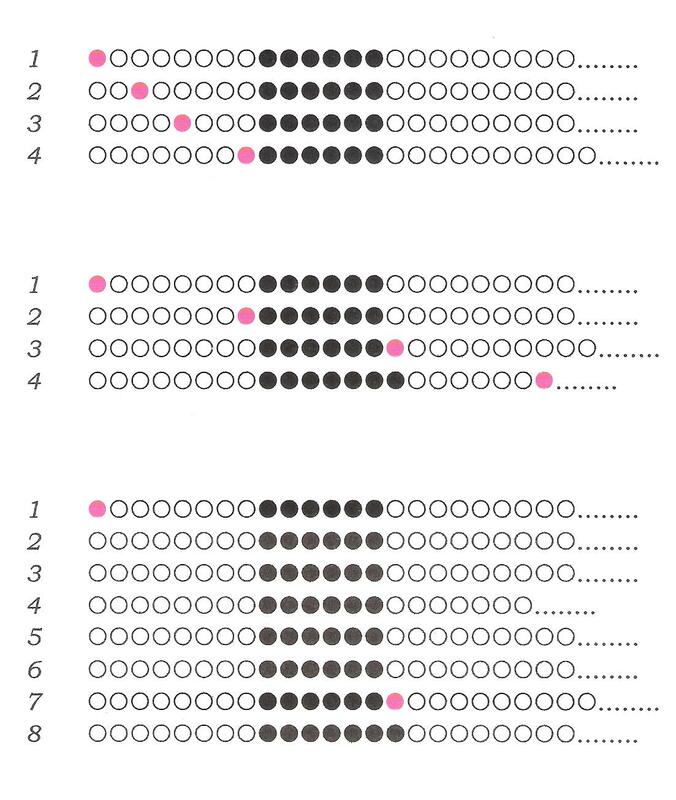 There would only be four appearances (black dots) in a period of 786 ksanas, and there would inevitably be very large blank sections of the Locality when the ultimate event made no appearance. Since, by definition, everything in UET is finite, there must be a maximum number of possible consecutive gaps or non-reappearances. For example, if we set the limit at, say, 20 blank lines, or 200, this would mean that, each time this blank period was observed, we could conclude that the event-chain had terminated. This is the UET equivalent of the Principle of Spatio-Temporal Continuity and effectively excludes phenomena such as an ultimate event in an event-chain making its re-appearance a century later than its first appearance. This limit would have to be estimated on the basis of experiments since I do not see how a specific value can be derived from theoretical considerations alone. It is tempting to estimate that this value would involve c* or a multiple of c* but this is only a wild guess ─ Nature does not always favour elegance and simplicity. Such a rule would limit how ‘stretched out’ an event-chain can be temporally and, in reality , there may not after all be a hard and fast general rule : the maximal extent of the gap could decline exponentially or in accordance with some other function. That is, an abnormally long gap followed by the re-appearance of an event, would decrease the possible upper limit slightly in much the same way as chance associations increase the likelihood of an event-chain forming in the first place. If, say, there was an original limit of a gap of 20 ksanas, whenever the re-appearance rate had a gap of 19, the limit would be reduced to 19 and so on. It is important to be clear that we are not talking about the phenomenon of ‘time dilation’ which concerns only the interval between one ksana and the next according to a particular viewpoint. Here, we simply have an event-chain where an ultimate event is repeating at the same spot on the spatial part of the Locality : it is ‘at rest’ and not displacing itself laterally at all. The consequences for other viewpoints would have to be investigated. Since Galileo, and subsequently Einstein, it has become customary in physics to distinguish, not between rest and motion, but rather between unaccelerated motion and accelerated motion. And the category of ‘unaccelerated motion’ includes all possible constant straight-line speeds including zero (rest). It seems, then, that there is no true distinction to be made between ‘rest’ and motion just so long as the latter is motion in a straight line at a constant displacement rate. This ‘relativisation’ of motion in effect means that an ‘inertial system’ or a particle at rest within an inertial system does not really have a specific velocity at all, since any estimated velocity is as ‘true’ as any other. So, seemingly, ‘velocity’ is not a property of a single body but only of a system of at least two bodies. This is, in a sense, rather odd) since there can be no doubt that a ‘change of velocity’, an acceleration, really is a feature of a single body (or is it?). Consider a spaceship which is either completely alone in the universe or sufficiently remote from all massive bodies that it can be considered in isolation. What is its speed? It has none since there is no reference system or body to which its speed can be referred. It is, then, at rest ─ or this is what we must assume if there are no internal signs of acceleration such as plates falling around or rattling doors and so on. If the spaceship is propelling itself forward (or in some direction we call ‘forward’) intermittently by jet propulsion the acceleration will be note by the voyagers inside the ship supposing there are some. Suppose there is no further discharge of chemicals for a while. Is the spaceship now moving at a different and greater velocity than before? Not really. One could I suppose refer the vessel’s new state of motion to the centre of mass of the ejected chemicals but this seems rather artificial especially as they are going to be dispersed. No matter how many times this happens, the ship will not be gaining speed, or so it would appear. On the other hand, the changes in velocity, or accelerations are undoubtedly real since their effects can be observed within the reference frame. So what to conclude? One could say that ‘acceleration’ has ‘higher reality status’ than simple velocity since it does not depend on a reference point outside the system. ‘Velocity’ is a ‘reality of second order’ whereas acceleration is a ‘reality of first order’. But once again there is a difference between normal physics and UET physics in this respect. Although the distinction between unaccelerated and accelerated motion is taken over into UET (re-baptised ‘regular’ and ‘irregular’ motion), there is in Ultimate Event Theory, but not in contemporary physics, a kind of ‘velocity’ that has nothing to do with any other body whatsoever, namely the event-chain’s re-appearance rate. When one has spent some time studying Relativity one ends up wondering whether after all “everything is relative” and quite a lot of physicists and philosophers seems to actually believe something not far from this : the universe is evaporating away as we look it and leaving nothing but a trail of unintelligible mathematical formulae. In Quantum Mechanics (as Heisenberg envisaged it anyway) the properties of a particular ‘body’ involve the properties of all the other bodies in the universe, so that there remain very few, if any, intrinsic properties that a body or system can possess. However, in UET, there is a reality safety net. For there are at least two things that are not relative, since they pertain to the event-chain or event-conglomerate itself whether it is alone in the universe or embedded in a dense network of intersecting event-chains we view as matter. These two things are (1) occurrence and (2) rate of occurrence and both of them are straight numbers, or ratios of integers. An ultimate event either has occurrence or it does not : there is no such thing as the ‘demi-occurrence’ of an event (though there might be such a thing as a potential event). Every macro event is (by the preliminary postulates of UET) made up of a finite number of ultimate events and every trajectory of every event-conglomerate has an event number associated with it. But this is not all. Every event-chain ─ or at any rate normal or ‘well-behaved’ event-chain ─ has a ‘re-appearance rate’. This ‘re-appearance rate’ may well change considerably during the life span of a particular event-chain, either randomly or following a particular rule, and, more significantly, the ‘re-appearance rates’ of event-conglomerates (particles, solid bodies and so on) can, and almost certainly do, differ considerably from each other. One ‘particle’ might have a re-appearance rate of 4, (i.e. re-appear every fourth ksana) another with the same displacement rate with respect to the first a rate of 167 and so on. And this would have great implications for collisions between event-chains and event-conglomerates. What happens during a collision? One or more solid bodies are disputing the occupation of territory that lies on their trajectories. If the two objects miss each other, even narrowly, there is no problem : the objects occupy ‘free’ territory. In UET event conglomerates have two kinds of ‘velocity’, firstly their intrinsic re-appearance rates which may differ considerably, and, secondly, their displacement rate relative to each other. Every event-chain may be considered to be ‘at rest’ with respect to itself, indeed it is hard to see how it could be anything at all if this were not the case. But the relative speed of even unaccelerated event-chains will not usually be zero and is perfectly real since it has observable and often dramatic consequences. Now, in normal physics, space, time and existence itself is regarded as continuous, so two objects will collide if their trajectories intersect and they will miss each other if their trajectories do not intersect. All this is absolutely clearcut, at least in principle. However, in UET there are two quite different ways in which ‘particles’ (small event conglomerates) can miss each other. First of all, there is the case when both objects (repeating event-conglomerates) have a 1/1 re-appearance rate, i.e. there is an ultimate event at every ksana in both cases. If object B is both dense and occupies a relatively large region of the Locality at each re-appearance, and the relative speed is low, the chances are that the two objects will collide. 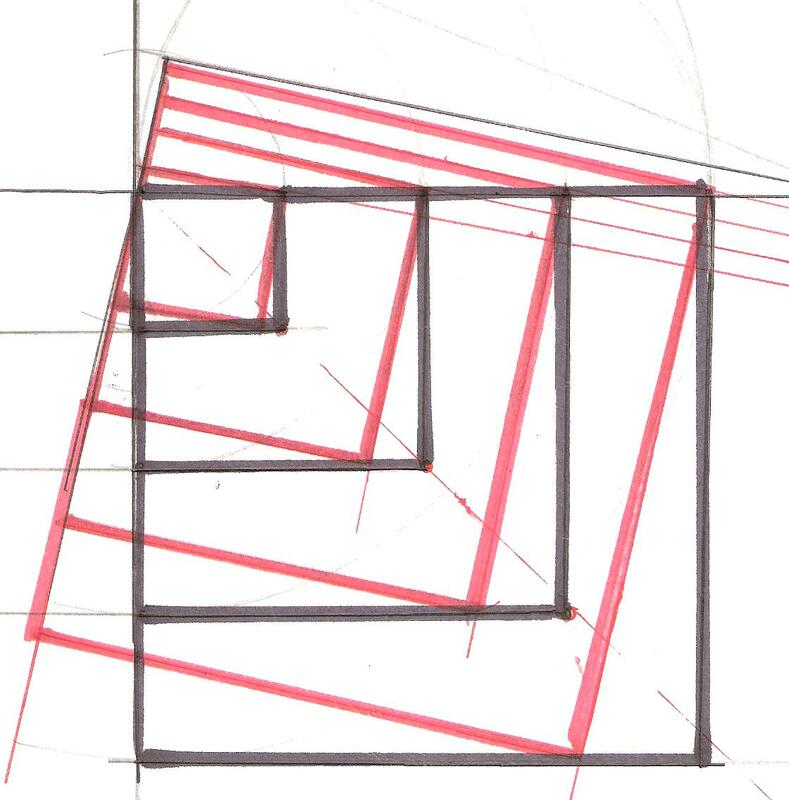 For, suppose a relative displacement rate of 2 spaces to the right (or left) at each ksana and take B to be stationary and A, marked in red, displacing itself two spaces at every ksana. Clearly, there is going to be trouble at the very next ksana. However, since space/time and existence and everything else (except possibly the Event Locality) is not continuous in UET, if the relative speed of the two objects were a good deal greater, say 7 spaces per 7 ksanas (a rate of 7/7) the red event-chain might manage to just miss the black object. This could not happen in a system that assumes the Principle of Spatio-Temporal Continuity : in UET there is leap-frogging with space and time if you like. For the red event-chain has missed out certain positions on the Locality which, in principle could have been occupied. But this is not all. A collision could also have been avoided if the red chain had possessed a different re-appearance rate even though it remained a ‘slow’ chain compared to the black one. For consider a 7/7 re-appearance rate i.e. one appearance every seven ksanas and a displacement rate of two spaces per ksana relative to the black conglomerate taken as being stationary. 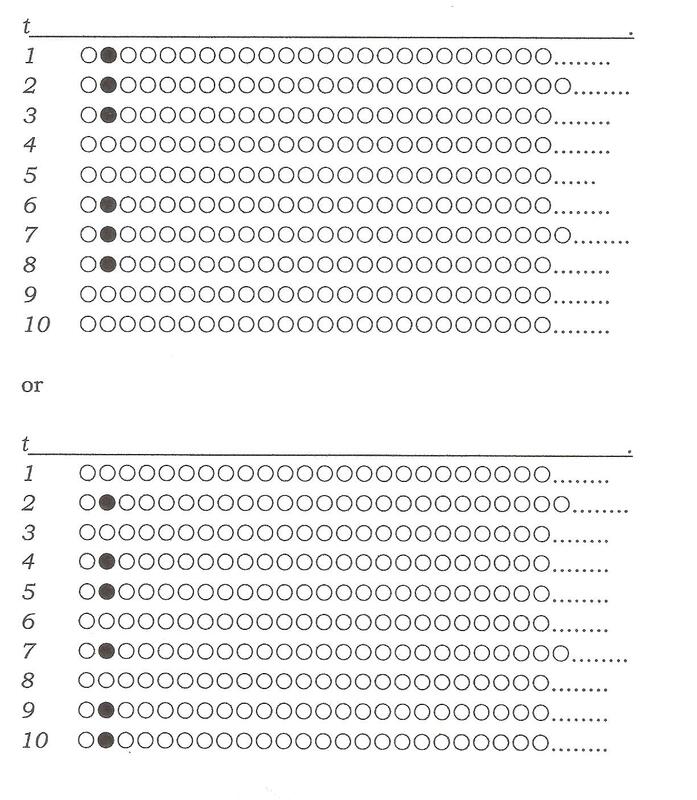 This would work out to an effective rate of 14 spaces to the right at each appearance ─ more than enough to miss the black event-conglomerate. Moreover, if we have a repeating event-conglomerate that is very compact, i.e. occupies very few neighbouring grid-spaces at each appearance (at the limit just one), and is also extremely rapid compared to the much larger conglomerates it is likely to come across, this ‘event-particle’ will miss almost everything all the time. In UET it is much more of a problem how a small and ‘rapid’ event-particle can ever collide with anything at all (and thus be perceived) than for a particle to apparently disappear into thin air. When I first came to this rather improbable conclusion I was somewhat startled. But I did not know at the time that neutrinos, which are thought to have a very small mass and to travel nearly at the speed of light, are by far the commonest particles in the universe and, even though millions are passing through my fingers as I write this sentence, they are incredibly difficult to detect because they interact with ordinary ‘matter’ so rarely (Note 3). This, of course, is exactly what I would expect ─ though, on the other hand, it is a mystery why it is so easy to intercept photons and other particles. It is possible that the question of re-appearance rates has something to do with this : clearly neutrinos are not only extremely compact, have very high speed compared to most material objects, but also have an abnormally high re-appearance rate, near to the maximum. In the adjacent diagram we have the same angle sin θ = v/c but progressively more extended reappearance rates 1/1; 2/2; 3/3; and so on. The total area taken over n ksanas will be the same but the behaviour of the event-chains will be very different. I suspect that the question of different re-appearance rates has vast importance in all branches of physics. For it could well be that it is a similarity of re-appearance rates ─ a sort of ‘event resonance’ ─ that draws disparate event chains together and indeed is instrumental in the formation of the very earliest event-chains to emerge from the initial randomness that preceded the Big Bang or similar macro events. Note 1 Compared to the usual 3 × 108 metres/second the unitary value of s0­/t0 seems absurdly small. But one must understand that s0­/t0 is a ratio and that we are dealing with very small units of distance and time. We only perceive large multiples of these units and it is important to bear in mind that s0is a maximum while t0 is a minimum. The actual kernel, where each ultimate event has occurrence, turns out to be s0/c* = su so in ‘ultimate units’ the upper limit is c* su/t0. It is nonetheless a surprising and somewhat inexplicable physiological fact that we, as human beings, have a pretty good sense of distance but an incredibly crude sense of time. It is only necessary to pass images at a rate of about eight per second for the brain to interpret the successive in images as a continuum and the film industry is based on this circumstance. Physicists, however, gaily talk of all sorts of important changes happening millionths or billionths of a second and in an ordinary digital watch the quartz crystal is vibrating thousands of times a second (293,000 I believe). Note 2 Only Descartes amongst Western thinkers realized there was a problem here and ascribed the power of apparent self-perpetuation to the repeated intervention of God; today, in a secular world, we perforce ascribe it to ‘ natural forces’. In effect, in UET, everything is pushed one stage back. For Newton and Galileo the ‘natural’ state of objects was to continue existing in constant straight line motion whereas in UET the ‘natural’ state of ultimate events is to disappear for ever. If anything does persist, this shows there is a force at work. The Buddhists call this all-powerful causal force ‘karma’ but unfortunately they were only interested in the moral, as opposed to physical, implications of karmic force otherwise we would probably have had a modern theory of physics centuries earlier than we actually did.